Usually, us humans don’t think of insects much. Beyond the mild annoyance of a mosquito bite when sitting around the campfire, or swatting away an obnoxious fly in the kitchen, we tend to forget they exist – and when we remember, it’s usually because we want them gone. But what if you were to wake tomorrow in a world without insects? Would it really be a better place? At first it might seem so, but unbeknownst to us, these little flies, bees, and other buzzing buddies are pulling much more than their weight in keeping our environment healthy. All insects, from the charismatic butterfly to the infuriating mosquito, play critical roles in natural systems. Flying insects, in particular, are crucial pieces of a complex natural puzzle. Firstly, they are an important source of food for birds, bats, frogs, fish, and other animals. In fact, as human population soars and the resources needed to feed us all become more and more scarce, insects are becoming an increasingly important source of much-needed protein for humans. Besides being eaten, flying insects also make themselves useful by acting as pollinators. Butterflies, bees, wasps, and flies all transfer pollen grains from male to female flowers, thereby assisting plants in reproducing. Male mosquitoes, which feed on nectar instead of blood, also act as pollinators, primarily in wetlands. Without pollinators, we would lose about “one out of every three bites of food we eat”, as pollination is necessary to grow many important crops. So, what would happen if all these tiny minions disappeared? Unfortunately, we may be on the verge of finding out. Many previous studies have warned that certain species of insects are in decline. You may, for instance, be familiar with the plight of the honey bee; Many bee species, in fact, are suffering steep population declines due to habitat loss and pesticide use, with recent reports suggesting more than 25% of species are at risk for extinction. While reports have been trickling in on specific species like bees and butterflies, we don’t know very much about how environmental changes are affecting flying insects as a group. Since many insects in this group perform similar functions, understanding how whole insect populations are changing can give us an idea of whether one species might step in to take another declining species’ place, or whether all species are in trouble. Figure 1: Malaise trap used by researchers at one of the insect collection sites in this study. Source: Hallmann et al., PLOS One, 2017. To take a closer look at how flying insects have been faring, scientists at Radboud University in the Netherlands worked with the German Entomological Society and the University of Sussex in the United Kingdom to track flying insect populations throughout Germany for almost three decades. The researchers used Malaise traps (see Figure 1) to collect flying insects from different locations within 63 German nature preserves from 1989 to 2016. A Malaise trap is a tent-like structure made of netting that corrals flying insects into a collection vessel, which is located at the highest point in the tent structure. Malaise traps were set up at sites representing a variety of different types of landscapes including dunes, grasslands, and shrub-lands with different levels of productivity (biomass production in an ecosystem). Different sites were sampled from year to year, giving researchers an overview of total flying insect populations at a wide variety of locations over a long period of time. 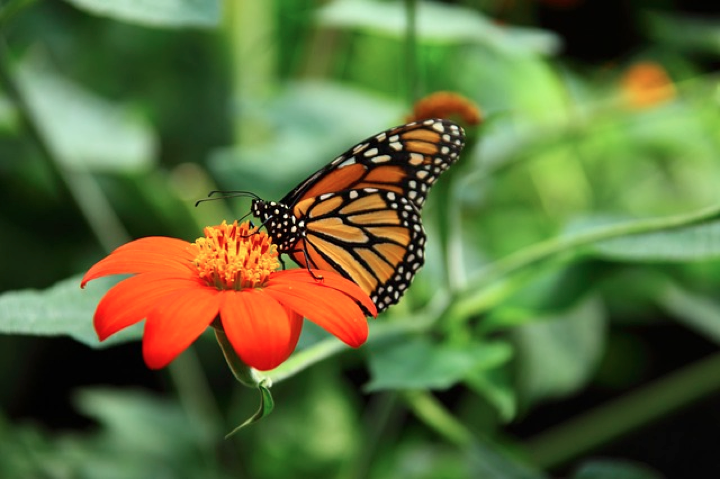 What’s Changing Along with Insect Populations? Along with using the Malaise traps to track changes in insect population over time, the researchers wanted to see if any external factors like climatic change might be affecting populations. To do this, they recorded daily temperature, rainfall, and wind speed from nearby weather stations during sample collection. They also used aerial photos of the region to analyze how land around the traps was being used and developed, and how this changed over time. In addition, they assessed the number and types of plants around each trap and how they changed over time, and whether this might affect insect populations. What Can We Learn from a Whole Lot of Bugs? Figure 2. A dismal future for our buzzing buddies: While insect populations naturally increase in summer months (as shown here by the peaking of insect biomass in July and August), that’s also the season when declines over the years are most marked. Year-to-year differences in biomass are shown here using color, with dark blue dots represent the earliest years, and yellow dots the latest years, of the study. Source: Hallmann et al., PLOS One, 2017. Over 27 years, the researchers collected a total of 53.54 kg (that’s about 118 lbs) of flying insects! So, what can we learn from analyzing a small human’s worth of insects? To measure a meaningful trend over the years, the authors first had to account for sources of natural annual variability in insect populations. For instance, insect numbers are greater in summer than fall, and are greater in habitats with more trees and vegetation than in dryer, less productive ones, so seasonal variation and habitat quality were corrected for. Unfortunately, the data reveal a pretty dismal future for flying insects. After correcting for natural sources of variability, the researchers observed a stark trend: regardless of the type of habitat considered, precipitous declines in total insect biomass (weight of insect bodies) have occurred since the study began in 1989. When considering data from all seasons, there was a loss in biomass of about 77%. Losses were most pronounced in mid-summer, where the data showed an 82% decline in the total weight of flying insects collected from 1989 to 2016. Despite their thorough collection of data on external factors that might be causing the decline, researchers found that changes in climate, land cover, and other habitat quality metrics did not seem to explain the observed decline in insect populations. In fact, the scientists saw increasing temperature and decreasing areas of arable land over the years, both of which would be expected to cause increases in insect biomass. The authors do propose some other factors that could be contributing to the decline that weren’t tracked. Chief among them is increased agricultural activity, including increases in pesticide and fertilizer usage. The authors observed that insects are attracted to croplands, meaning that increases in these types of landscapes near the nature reserves where the study was conducted may serve to attract insects away from study sites, causing a decline in the local area. However, many factors associated with farmland, such as the use of pesticides, could also contribute to insects not just moving from one area to another, but also being killed off. The findings of this study suggest previous reports noting losses for key species such as butterflies and bees are a symptom of a much greater problem affecting all flying insects. Seeing as insects are essential to most food webs and are also crucial to the health of crops and other plants via pollination, these declines will have (and are already having) far-reaching repercussions. To save our insect populations, we still have to answer a lot of crucial questions. For one, what’s causing the decline? Scientists in this study were not able to pinpoint a specific cause, and more research needs to be done to understand how human activities are disturbing the delicate natural systems that keep insect populations healthy. Understanding what factors are most damaging to insects will help us to effectively reverse this worrisome trend. Likely, it is a combination of different activities, including habitat loss, pesticide usage, and increasing frequency of extreme weather events due to climate change that are disturbing insect populations. Hopefully, scientists and citizens working together to reduce use of harmful pesticides and restore important insect habitats can have an impact, so that future generations won’t have to learn what it’s like to live in a world without our charismatic butterflies, or our infuriating mosquitoes.